As you might imagine, 'Star Wars' gave the format quite a boost. Blu-ray sales are up significantly this year, with growth reaching 35 percent in the U.S. Last year, 85 million Blu-rays were sold. This year the estimate is sitting at 115 million. It's a big step forward and certainly a sign of things to come. 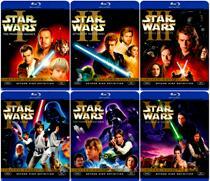 Part of the reason, of course, is the release of 'Star Wars' on Blu-ray. The HD version of the series inspired quite a few first-time Blu-ray disc purchases and spurred on sales of players. What may be even more important is the price of Blu-ray players. Customers are seeing Blu-ray players and DVD players at similar price points and at that point there's no reason to stick with DVD. It's getting to the point that making DVD players seems a bit pointless. One thing that needs to happen, according to Futuresource analyst Jim Bottoms, is a reduction in the prices of Blu-ray discs. In Europe, where sale growth is even stronger, there's a much smaller difference between DVD and Blu-ray prices.